Great Place to Work® is pleased to announce the 2018 list of Best Workplaces™ in Quebec. To be eligible for this list, organizations must be Great Place to Work Certified™ in the past year, be headquartered in Quebec, and have at least 15 employees working in the province. We determined the BEST based the overall Trust Index score from their Quebec-based employees. 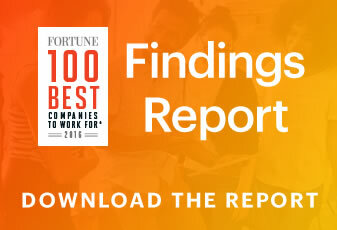 The Best Workplaces™ in Quebec are a unique group of companies. Not only are employees having a great workplace experience, but they’re also enjoying great business results. When surveyed, 92% of employees agree their workplace is great, and 60% of these companies introduced a new product or service to market last year! So, what is the secret of their success? We asked Manon Poirier, CEO of the Ordre des conseillers en ressources humaines agréés du Québec (CRHA) to shed some light on the recent advancements and challenges facing the Quebec labour market. According to Poirier, the biggest challenge facing Quebec employers in the coming year is the labour shortage. Quebec employers, like those in the rest of Canada, are really struggling to fill positions of all types, both skilled and unskilled. According to Poirier, this really boils down to demographics: “Quebec has a significant aging population – the oldest average age in the world, second only to Japan – so we have less people in the active job market. This demographic shift is something we’ve been hearing about for at least twenty years, and we are feeling it now”. Work life balance has been an area of focus for Quebec employers for some time, and in many regards, they’re a few steps ahead of the rest of Canada. According to Poirier, "Work-life balance is top of mind for employees of all ages, not just millennials. It is one of the key reasons an employee accepts a job with a particular organization and also one of the reasons they leave." For example, at AbbVie, about 40% of employees are field-based and have their office at home. To ensure these valued employees have access to resources and assets they need to do their jobs, AbbVie provides tools like printers and lockers and reimburses expenses like phone and Internet fees. Not to leave the remaining 60% of employees out of the benefit, they are eligible to work from home on a regular or ad hoc basis. This allows them the flexibility they need to avoid the occasional traffic or better focus on an important deliverable. At eXplorance, all employees have access to their Banking Privilege Program to help them plan for their financial future. The program includes free financial advisory services, the lowest rates for loans, mortgages, line of credit, credit cards, etc. and advice and guidance on buying and owning a home, investing in the future, and managing day-to-day expenses. According to Poirier, today’s employees are working more for their overall employability and less for longevity with a particular organization. Employers have a role in helping employees develop these skills that are going to be so important in the future, but there will be a return on this investment: “When you invest time and energy in developing employees, they will reward you with their loyalty”. At Tungsten Revenue Consultants, they believe that no one should put their career on hold while working at a job; rather, each employee's work should be relevant and directly help them build towards their future aspirations. Last year they introduced an employee-owned business concept that would act as a training program for aspiring entrepreneurs within the company. Its purpose is to equip employees to be able to run their own business in the future if they choose by giving them opportunities to succeed as micro-entrepreneurs within the safety and framework of Tungsten. At Beyond Technologies, instead of having a traditional supervisor, employees have a career counselor who is more like a coach. Career counselors are senior managers within the organization who provide performance feedback, guidance on training and staffing choices, and who have an understanding of the employee's career goals. This model helps employees to continuously feel engaged and know they have a future in the organization. To demonstrate their commitment to inclusion and innovation, Cadence launched a Diversity and Inclusion portal to provide a central place for employees to learn about Cadence’s diversity and inclusion programs and policies, build internal awareness around diversity resources and support, and create a place for employees to start their own communities. At Cadence, they are always looking for new ways to inspire all employees to take risks, collaborate, and innovate. At Kronos, they care about fostering a culture of innovation that challenges Kronos to evolve in all areas of business. Whether you work in product development, finance, HR or marketing, it is every Kronite’s responsibility to push past the status quo to propel the business in an upward motion. Through their Salesforce Chatter platform, they ask for employee feedback and organically receive ideas for better ways of doing things at Kronos. For example, they recently introduced their Workforce Ready InnoSprint, which invites all employees worldwide to submit ideas, setting the wheels in motion for inventive ideas to be born. Each quarter, all ideas submitted are voted on by all team members and one is selected to undergo the InnoSprint process.